I opened my garage door this morning to find a seething mass of Pavement Ants (Tetramorium caespitum) roiling around the expansion joint where the driveway meets the garage. This was not an "ant swarm" where a large number of winged ants (alates) fly off and mate. Love was not in the air. It was a full-blown, no-holds-bared ant war! A close examination of the melee revealed ants locked mandible-to-mandible with one another in ruthless mortal combat. Individual victories appeared marked by mutilations and dismemberment of the foe. I was glad I hadn't eaten breakfast! This pugnacious non-native species was introduced to the U.S. over 100 years ago. Their habit of locating their underground colonies beside or beneath sidewalks gives rise to their common name. 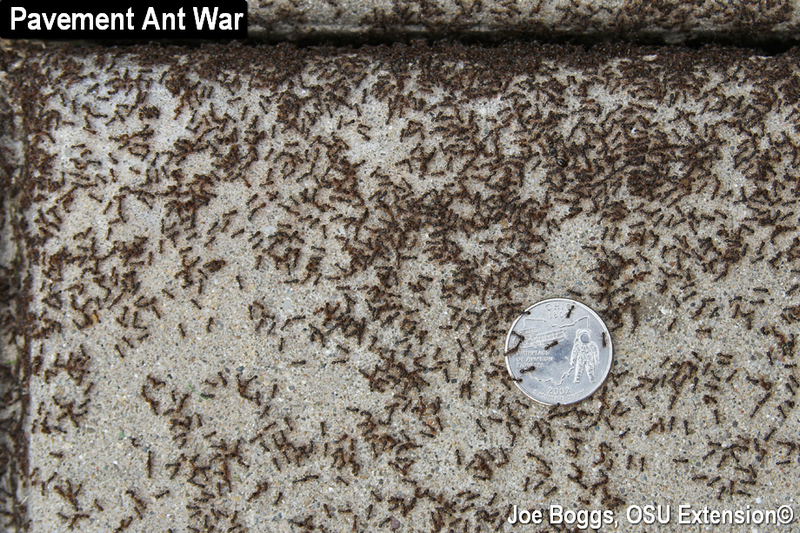 Mounds of loose soil particles emerging from sidewalk cracks or expansion joints are often the work of pavement ants. The ants scavenge for a wide variety of food including live and dead insects, honeydew from aphids, grease, etc. Pavement ants are very protective of their feeding territory and intolerant of nearby colonies. They are well-known for their bare-tarsal brawls. Battles may occur as a single, massive, swirling clash, or as a serious of smaller pitched skirmishes with constantly shifting battle lines. Some ant wars arise as territorial disputes resulting from scavenging workers based in adjacent colonies continually bumping into each other. Others occur as colonies try to expand their territories with two colonies "planting their ant flags" in each other's territories. These disputes are settled on a neutral battlefield between the two colonies, presumably with ant-drums and bugles blowing. The most brutal battles happen when one colony decides to raid a nearby colony. These fights are bloody affairs with macerated bodies quickly piling up. I believe this was happening on my driveway, but it was hard to know for sure since neither side wore uniforms. Colony raids occur right on top of the colony that's having a bad ant day. The defending colony quickly pours all available combatants into the fray; even alates may be seen mixing it up with the opposing force. Alates are much larger than their colony kin; however, they are built for love, not war. I felt sorry for them. It was Aphrodite meeting Ares; Woodstock meeting Gettysburg! As with most ant wars, the battle I witnessed was settled quickly. It was over after a few hours and nothing was left on the battlefield to mark the epic confrontation. That's because the spoils of war for ants includes the bodies of the defeated … a different twist on carry-out.